Whilst Santa himself mysteriously moves around the world, seemingly in many places at once, his elves prefer to stay close to their homes and their own elf families. The live in very tight knit groups but all go through a very similar upbringing in the traditional elf manner. Their schooling is not quite the same as ours. Whilst our children concentrate on learning to read and write, elf children are being taught how to tip-toe silently through the woods and sneak up the stairs carrying sacks of toys without making a sound. They also have to learn how to look after reindeer and how to drive Santa’s magical sleigh, and that is before they have learnt how to make the presents that Santa gives out across the world. One of the most important lessons they learn is one we would recognise though, it is called “Family Kindness”. They learn all the best ways about being good, kind and loving to their family and to other people and all elves must pass the exam before they are allowed to help Santa. Once they have passed, they enter their elf family business and many of the families specialise in particular types of toy and game making. 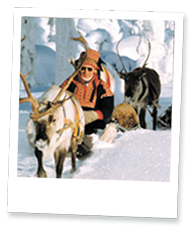 In the south of Lapland the elves are renowned for their mechanical toy making skills. They have very sharp eyes and dextrous fingers and are able to hold tiny pieces and connect several sections at once. Often they have competitions between themselves as to who can make the toy the quickest, with their eyes closed! In the west, the elves take a more modern approach and manufacture a wide range of hand-held electronic games which they practice whenever Mrs Claus is not watching over them. The Eastern Elf tribes have great sewing skills and are generally a quieter bunch who like to sit indoors, in front of roaring log fires, making soft cuddly toys for children all over the world to love and cherish. The Santa’s Lapland resort of Saariselkä is home to Santa’s northern tribe of Saari Elves, a hardy outdoor bunch, renowned for their lively energetic personalities, and whose ears and noses don’t grow so long as their cousins from other tribes, due to the time they spend outdoors, playing in the snow, rather than concentrating on toy-making in one of Santa’s busy workshops. Try to see if you can spot them playing in the snowy woods near Santa’s Cabin. 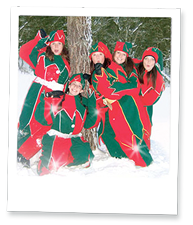 You can’t miss their jingling bells and bright red and green outfits. But beware – they can sometimes be a bit cheeky!